Whatcom Falls park in Bellingham is one of the few US based places I remember going to as a kid from British Columbia. I remember going down and spending the afternoon fishing and having lunch or dinner on one of the park benches. When I visited it again probably 20 years later I remembered the name, but not the waterfalls or what I was about to find to photograph. 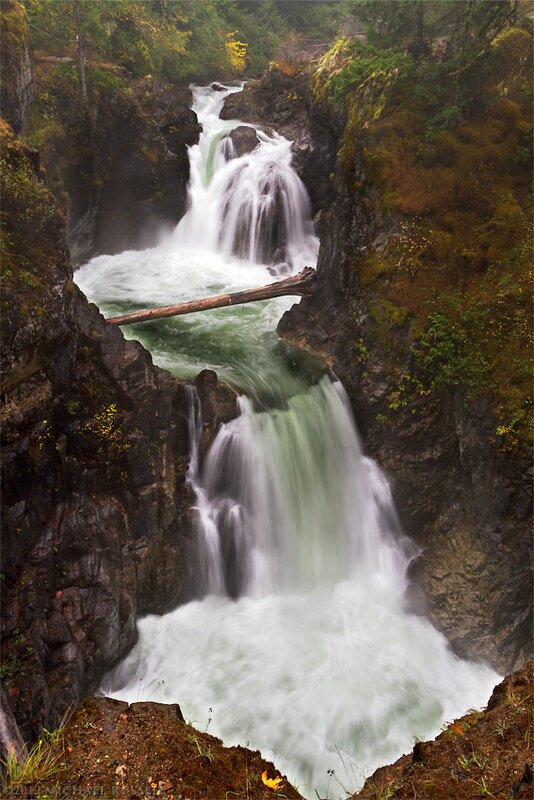 I made this image way back in 2009, but it remains one of my favourites of the main falls in Whatcom Falls Park. I occasionally “complain” about the fall foliage colours in this part of the world, but it looks like 2009 was a great year! Most of the fall foliage we get around here are from the Bigleaf Maple trees (Acer macrophyllum), or sometimes from the smaller Vine Maples (Acer circinatum). When they get the right conditions they can really give some great colors. 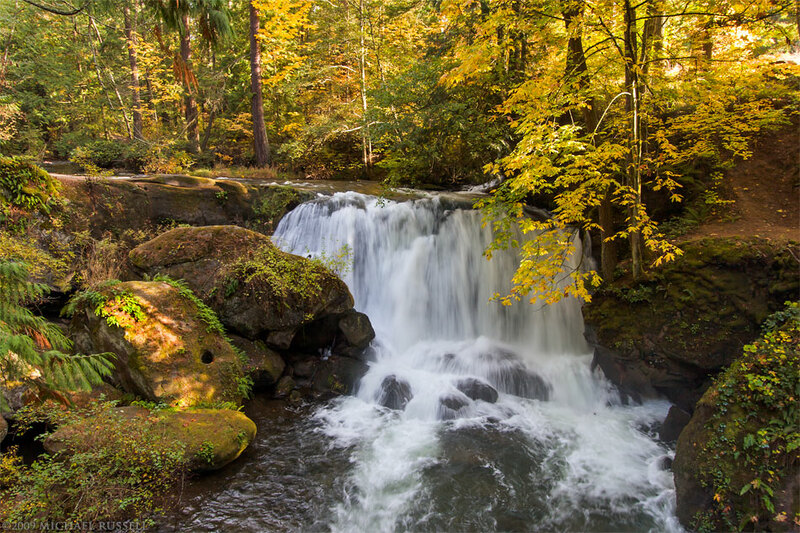 The above photograph is the view at Whatcom Falls park of the main waterfall from the Limestone Bridge that crosses Whatcom Creek. 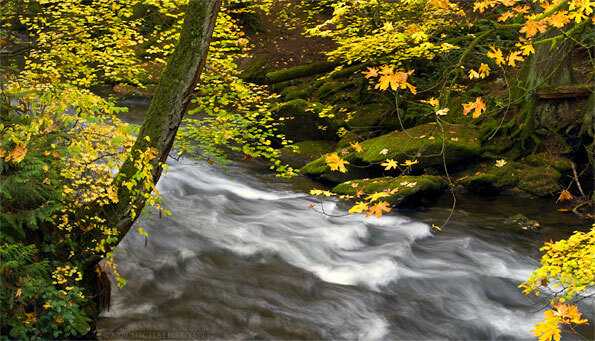 Most of the fall foliage colours in this first photograph are from Bigleaf Maple trees. This second photograph is the view looking downstream on the other side of that same Limestone Bridge. There are a few larger Bigleaf Maple leaves in this photo but most of the colour here comes from the smaller leaved Vine Maples. For my other photographs of Whatcom Falls Park please visit my Washington State Misc. Photos Gallery in my Image Library. Little Qualicum Falls at Little Qualicum Falls Provincial Park near Qualicum Beach, British Columbia, Canada. A few weeks ago I made a weekend trip to Vancouver Island in British Columbia Canada. One of the parks on my list to visit was Little Qualicum Falls Provincial Park – and it did not disappoint. 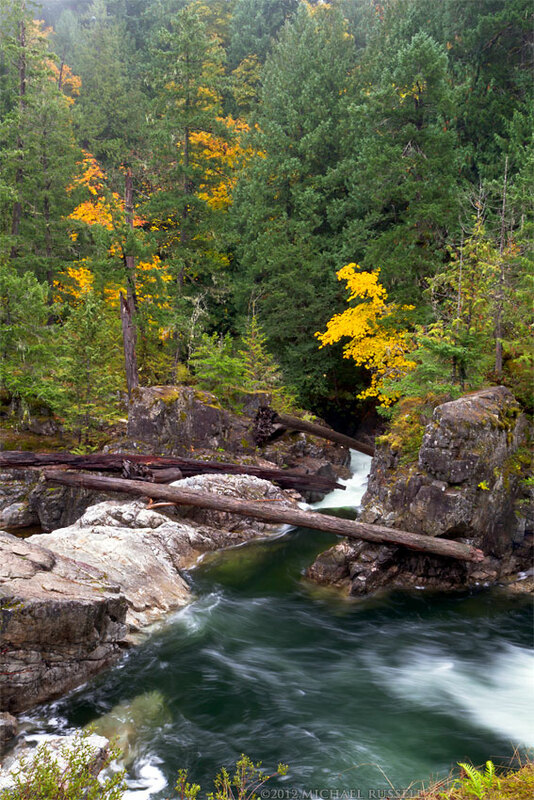 The main falls (top photo) – officially named Little Qualicum Falls is certainly much more spectacular than the Lower Falls (bottom) but both are nice. I had initially thought that the best Fall colours might have already faded on Vancouver Island – at least judging from what I’d been seeing around Vancouver and the Fraser Valley. The colours turned out to be perfect. There wasn’t much in the way of Vine Maple colour, but the Bigleaf Maples (Acer macrophyllum) had great colour – yellow and even some orange. It didn’t look like any of them had turned slightly then gone straight to brown which was common this year in some places. I was also extremely fortunate with the weather. The entire weekend was forecast for rain, at times heavy. In the three Provincial Parks that I visited there was absolutely no rain. All the plastic bags and camera/lens coverings I had prepared were not necessary. 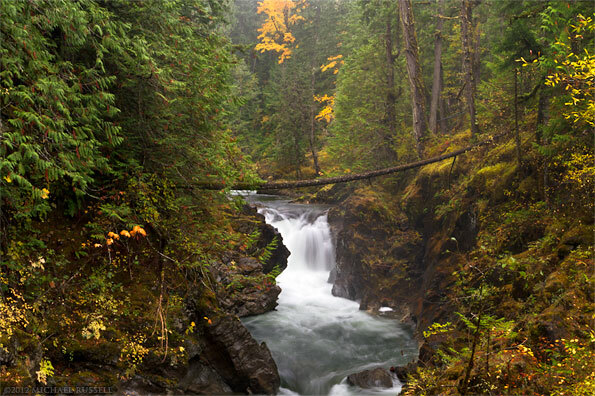 While I’d intended on photographing mostly rivers and waterfalls – great subjects in the rain, I was still happy to not have to deal with the possibility of wet equipment and clothing.